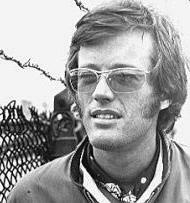 Most people know Peter Fonda as the world renowned actor/director/producer/screenwriter and the famous films he was involved with: 'The Wild Angels', 'The Trip', 'Easy Rider', and the list goes on and on. My personal favorite is the freaky 1975 horror film 'Race With The Devil', which co-stars Warren Oats, Loretta Swit and Lara Parker (Parker had previously done an excellent job playing a witch in one of my favorite 1970s TV shows, 'Kolchak: The Night Stalker', but now I'm really getting off topic!). What many people aren't aware of is that Fonda is quite an impressive singer and guitar player too. He was one of the few movie stars to hang regularly with major music artists of the 60s, including the Byrds. He also attended a party with The Beatles while they were in L.A. in 1965 and after dropping acid, began to talk about how he knew what it was like to be dead, having almost died on the operating table once as a child. John Lennon apparently overheard these remarks and reportedly wrote the lyrics "I know what it's like to be dead" for the song 'She Said She Said'. In 1966, Fonda was casually singing and playing guitar at another party where he was noticed by jazz trumpeter Hugh Masekela, who was so impressed that he offered to make a record with him. With the help of the Byrds' David Crosby and Roger McGuinn, Fonda and Masekela went into the studio and laid down no less than 16 tracks, but when all was said and done, Fonda decided not to release the material because in his words, "it wasn't there". In 1967, Fonda did issue one single, the Gram Parsons penned 'November Night', but what's featured on TWOS is the B-side of that 45 – an outstanding cover of Donovan's 'Catch The Wind'. Artist information sources include: An article by Richie Unterberger at All Music Guide.